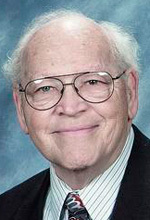 Deacon Thomas E. Eichman, 84, a retired permanent deacon at St. Kevin Parish in Springfield, died Nov. 27. Born in Philadelphia the son of the late Edward A. and Frances (Liebert) Eichman, he was a graduate of St. Joseph’s Preparatory School, Villanova University and Villanova School of Law. He was a veteran of the Korean War and practiced law until his retirement from Edward A. Eichman Associates PC in 2001. A resident of Springfield for over three decades, he was ordained to the diaconate in 1997, and served at St. Kevin until his 2010 retirement. He was especially devoted to the Legion of Mary of which he was chaplain in the parish. Deacon Eichman’s funeral Mass was celebrated by Archbishop Charles Chaput on Dec. 1. Concelebrants included Bishop John McIntyre, Msgr. Gregory Parlante, Fathers John J. Bradley and Roland Slobogin, Father Moloney, and Father Thomas P. Gillin, who was the homilist. Deacon Leonard J. Diana, who also serves at St. Kevin, was deacon of the Eucharist and Deacon Arthur McGuire was Deacon of the Word. Deacon Eichman is survived by his wife, Maureen (McDonnell) Eichman; son Thomas; daughter Frances McCabe; stepdaughters Sherry Kearney and Karen Monahan; five grandchildren and many nieces and nephews. Interment was at Westminster Cemetery, Bala Cynwyd. NEXT: In Loving Memory: Joseph Washklovitch Sr.